Over the last few years, I haven't logged major minutes watching the Sci Fi Channel. With the exception of the fantastic Battlestar Galactica, there's not much else worth watching on the network. Now that BSG is about to embark on its final voyage to that great tv show trash bin in the sky, the network is scrambling to re-define themselves. 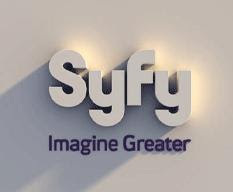 Sci Fi announced recently that they plan on re-branding the network as "Syfy" starting July 7th. Apparently the change was made primarily so the network can branch out to other medium (games, dvds, etc..) with a branded identity. The idea is that Syfy can be copyrighted but "Sci Fi," which is short for a genre, cannot. Personally I think the new logo and name is kinda goofy and will probably turn some nerds off from watching the network. I think the current logo/name works much better in identifying what the network actually is (I did the purple text and Saturn emblem). Regardless of the name of the network, I imagine SciFi/Syfy will lose some viewership once Commander Adama and the rest of the BSG cast sail off into the sunset on Friday night. When sci-fi as a genre is done right, it can be the best thing on television. Some of the best can be morality plays (BSG, DS9) or just shoot-em-up adventures with lots of effects (Aliens). It doesn't matter what name the channel has as long as the programming is good. After BSG's departure, "SyFy" will simply keep airing movies about giant animals going amok. There's nothing original in sci-fi anymore. BSG was a remake, the new Star Trek film is a remake, and so is Stargate. The last original sci-fi TV series to feature something original was Firefly.